Exciting news! FSDP is bringing communities together to empower families, restore health and save lives! Thanks to the generosity of friends and partners around the world we are making the family voice heard and we want to share the message of harm reduction by spotlighting the work from all of the wonderful organizations whose contributions are vital to our mission. 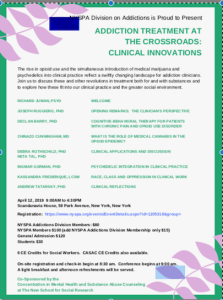 FSDP Board Member Dr. Andrew Tatarsky will be presenting at Scandinavia House, 58 Park Avenue, New York City on April 12 during an all-day panel discussion hosted by the NY State Psychological Association. 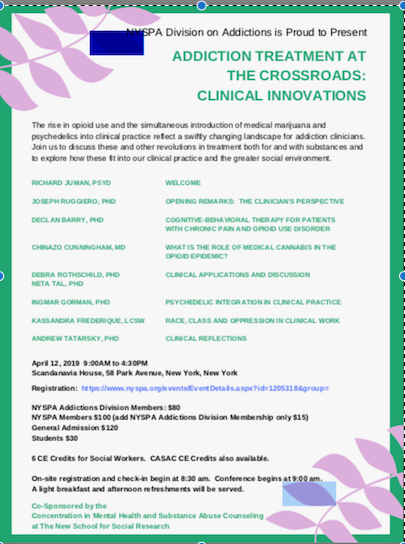 The event is titled Addiction Treatment At The Crossroads: Clinical Innovations, and presenters will discuss how the rise in opioid use and introduction of medical marijuana and psychedelics into clinical practice is revolutionizing the addiction treatment field. FSDP will have a table, so please come to this event and say hi to our board members! Next Next post: Spring and the Cycles of Change!